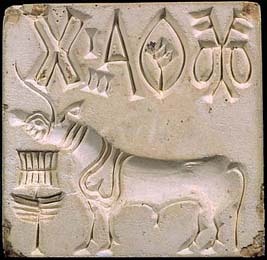 This seal from Mohenjo-daro measures 29 mm (1.14) inches on each side and is made of fired steatite. Steatite is an easily carved soft stone that becomes hard after firing. On the top are four "pictographs" of an as yet undeciphered Indus script, one of the very first writing systems in history. Below is the well-known unicorn figure of Indus Valley culture. Whether it designates a real or mythical animal is also unknown. Beneath it is a "sacred object," which could have been anything from an animal's trough to an incense burner.